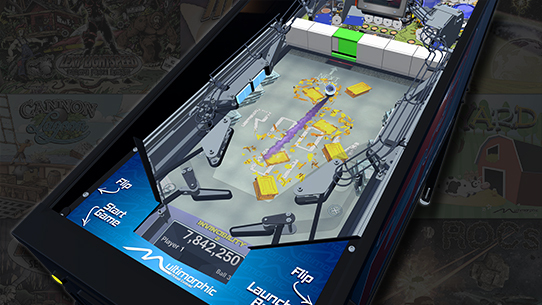 Multimorphic introduces the world’s first modular multi-game pinball platform designed specifically for consumers. 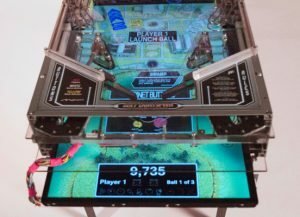 The P3 takes everything you love about pinball – a real steel ball, flippers, targets, bumpers, and ramps – and adds dynamic LCD graphics and ball tracking for a whole new level of interaction. On top of that, a third of the playfield can be swapped out for new games. Keep your furniture where it is – new games don’t require additional space! The artwork on the P3‘s lower playfield is dynamic and can even interact with the physical ball! The game knows exactly where the ball is at all times, allowing graphics to react to the ball’s presence and movement. Dynamic rollover targets, ball trails and full artwork changes – these are things you can’t experience with just a painted piece of wood. The upper playfield is an easily swapped module. Different games can use different modules, each providing a unique shot layout and theme-specific features and artwork. The P3 automatically identifies the installed module and configures the software accordingly, filtering your game list to show which ones are compatible with the module. Swapping modules is literally a 60-second job and doesn’t require any tools. The P3 is designed to be easy to service. Most of the mechanical assemblies simply slide out of the machine. 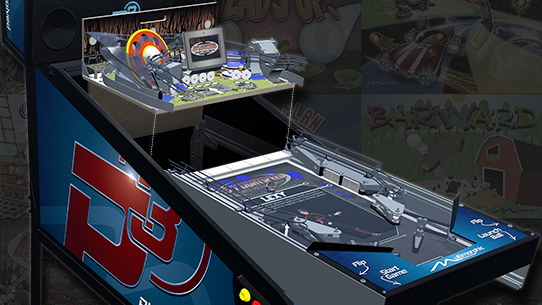 Experience pinball evolved – Buy a P3!